This recipe for Polish apple cake or jabłecznik (yah-BWETCH-neek) is from Gwizdały village in the Mazovia region, one of the stops on my tour with Poland Culinary Vacations. The recipe calls for a shortbread crust, cooked apples and a meringue and shortbread topping.The dough must be refrigerated for 1 hour before patting it into a 13x9-inch pan, so plan accordingly. In a large bowl, whisk together 1/2 pound all-purpose flour and 2 teaspoons baking powder. Cut in 4 ounces cold butter until mixture resembles coarse crumbs. Mix in 5 large room-temperature egg yolks and 1 cup sugar just until well combined. Wrap in plastic and refrigerate for 1 hour. Heat the oven to 350 F. Lightly grease a 13x9-inch baking pan and set aside. Coarsely grate 6 large tart peeled and cored apples and cook them in a large saucepan with 1 tablespoon sugar, 1 teaspoon cinnamon and a little water until tender and liquid has evaporated. Cool to room temperature. Remove dough from refrigerator and roll out 2/3. Return the remaining 1/3 of dough to the refrigerator to be used for the topping. Fit the rolled-out dough into the bottom and part way up the sides of the prepared 13x9-inch pan. Place room-temperature cooked apples onto pastry crust, spreading into an even layer. In a grease-free medium bowl, whip the 5 rooom-temperature egg whites until stiff. Gradually add 10 tablespoons of sugar, whipping constantly until stiff and glossy. Spread evenly over apples. Remove reserved 1/3 dough from refrigerator and coarsely grate over meringue. Bake 40 minutes or until golden. Let cool on a wire rack to room temperature before serving. 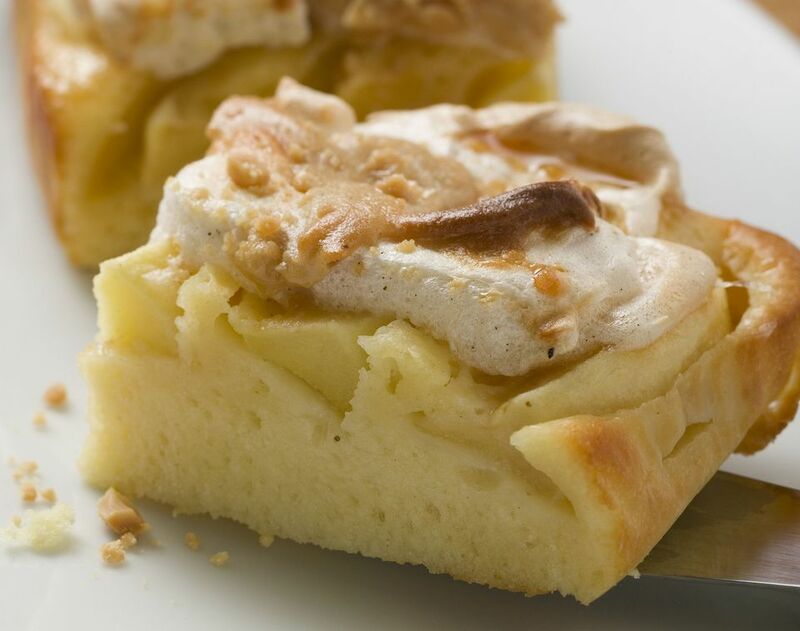 Polish apple cake - placek z jabłka (literally "flat cake with apples") - and Polish cheesecake - sernik - are two of the most frequently seen desserts at Polish tables. There are hundreds of recipes for both. The Polish version of apple pie is known as szarlotka and is reserved for fancier occasions. If you like, try this dough and topping with plums, peaches or nectarines. The result is just as tasty and you won't have to cook these fruits first.